National Muffin Day 2017 raised $2,200 on HandUp! Bake Muffins for Hungry Folks and Raise Money for Project Homeless Connect! Project Homeless Connect is a wonderful and important organization in San Francisco--now here's another way to contribute to them! Jacob "Muffin Man" Kaufman is celebrating with a challenge: for every person who bakes muffins and hands them out to hungry people in need on the streets, he will donate $10 to this campaign, with all proceeds going to PHC. In addition, his law firm Smithline PC, will be matching the donations! 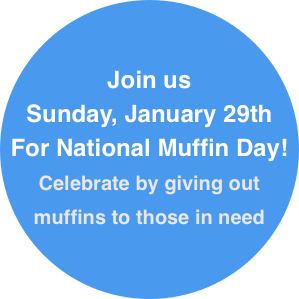 take a picture while you're handing them out and post it to Instagram, Twitter, or Facebook with the hashtag #givemuffins. You can also post it to the Facebook page below. Jacob Kaufman will donate $10 to this fund for every person that participates. Last year, 112 people participated - can you help us reach our goal of 200 people this year?! We can't wait to see your photos. Together, let's bake America muffins again! You'll start to receive updates in your email on National Muffin Day 2017's progress.